« Who Deserves Blame for the Oppressive Tax System, the IRS or Politicians? After the horrific school shooting in Parkland, Florida, I explained that the gun-control policies being pushed by left-leaning students such as David Hogg would be utterly ineffective at deterring evil people. But give the kid credit. He’s fully exploiting his 15 minutes of fame (in a way that makes Sandra Fluke look like an amateur). His latest idea is to somehow boycott financial firms that do business with gun manufacturers. Dana Loesch asked me to appear on her show to discuss the economics of this issue. It’s a Skype interview, so the quality on my end leaves something to be desired, but I hopefully got across my main point that boycotts only work if consumers change their buying patterns. And, to be blunt, David Hogg is not going to change the minds of people who appreciate the 2nd Amendment. I also explained that Hogg’s proposed boycott is a private version of Obama’s reprehensible Operation Chokepoint. Except it won’t work because Hogg’s hyperbole isn’t nearly as effective as the coercive power of government. Indeed, Hogg is far more likely to increase gun sales, which is the point of this bit of satire. Though I don’t want to imply that the leftist students from Parkland, Florida, have been completely ineffective. They demanded change. And the school gave it to them in the form of a preposterous requirement for see-through backpacks. Here are some details from a CNN story. Survivors of a school shooting in Parkland, Florida, returned from spring break Monday to new security measures that some students said made them feel like they were in prison. Marjory Stoneman Douglas students encountered security barriers and bag check lines as they entered campus Monday morning. 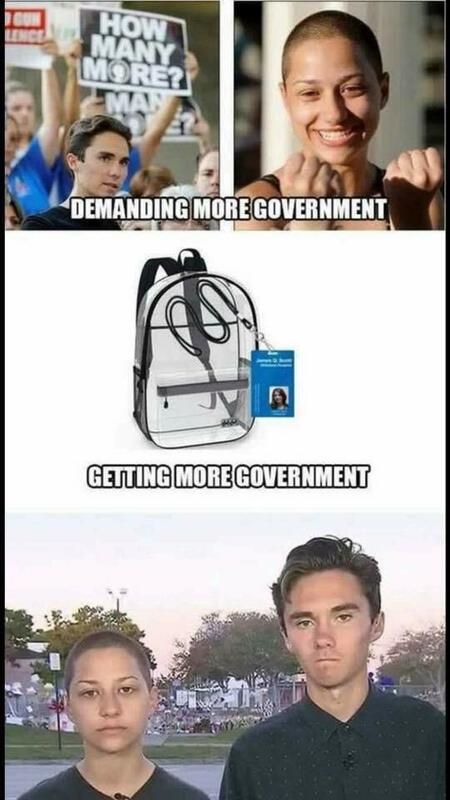 Inside the school, administrators handed out the students’ newest mandatory accessories: a see-through backpack much like the ones required at some stadiums and arenas… Now, with the bags, they’re sacrificing their privacy for what he and others consider an ineffective security measure. 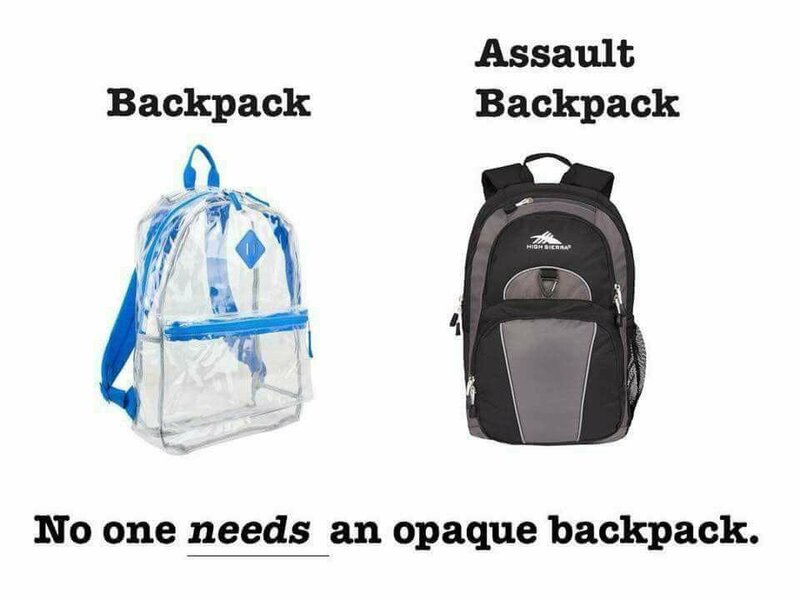 Of course these clear backpacks are a joke. But, as illustrated by this bit of satire, it’s rather naive to expect good results when you ask for more government. Surely we don’t want to run the risk of a student hiding a gun under their clothes. 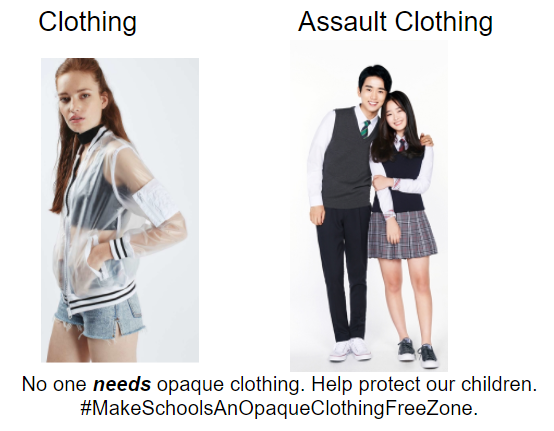 We need to ban “assault clothing”! 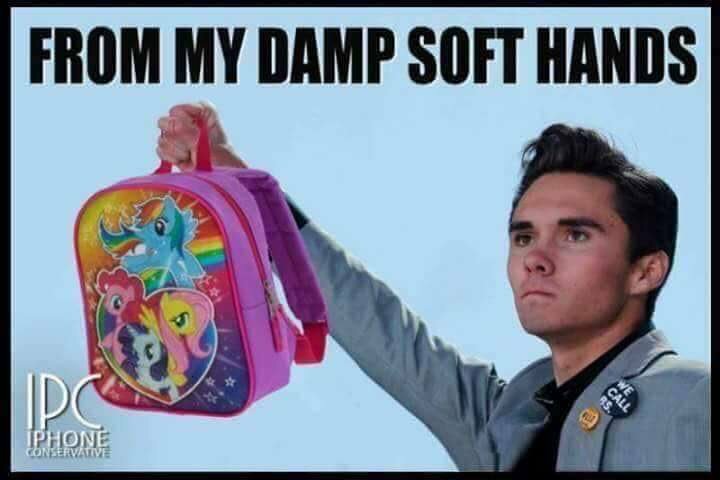 But David Hogg isn’t meekly acquiescing to see-through backpacks. At least according to this final bit of satire. Ouch. I thought some of the anti-Fluke humor was hard hitting, but both “hold my sippy cup” and “from my damp soft hands” are rather brutal. When you’re taught WHAT to think, rather than HOW to think by the strongly socialist education system, then having such perverted ideas may be inevitable. Has anyone asked this kid if he believes that his grand-mother/mother/sister/girl-friend has the right to defend herself from being attacked? Does he understand that he’s denying them the right to defend themselves from being raped? 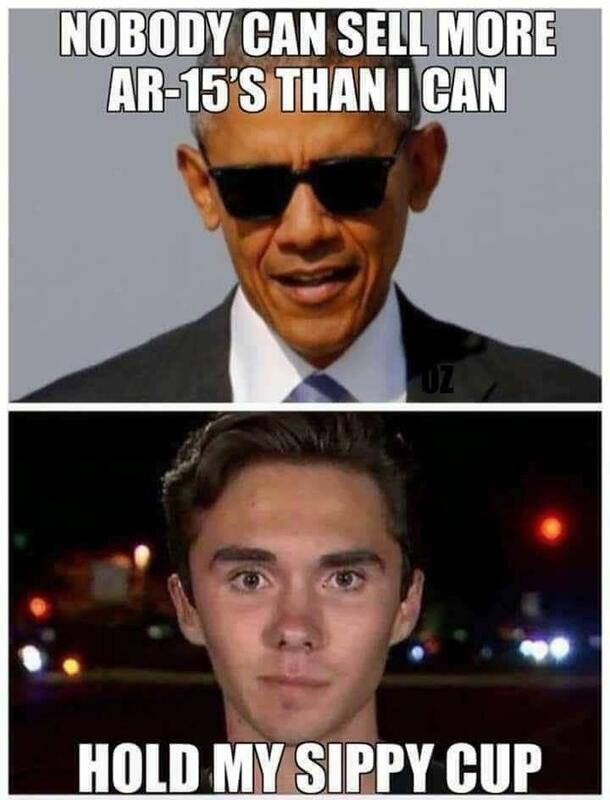 Hogg and the other crisis actors are in Soros’ pay. And I’m sure old Sorehead thinks he is getting his money’s worth, or he wouldn’t go on paying them. As far as denying gun stores access to financial services, this has been tried once already, in Operation Choke Point, and will probably be repeated every time a Democratic president is elected. I suggest that NRA’s management solve the problem by opening a members’ credit union. That would also persuade a lot of lapsed members, including myself, to rejoin. The only reason this idiot has gotten exposure is that people keep writing about him and his stupid ideas.